Ask the average person to describe the Christian life, and I’m pretty sure the word ‘boring’ is more likely to appear than the word ‘exciting’. People don’t seem to think that walking with God is an adventure. ‘Faith’ is a good thing to fall back on when things go wrong, when you want to be quiet and reflective or when you want to mark significant moments in your life. It’s great that people in the ‘post-Christian West’ still turn to God then, but is he really only there for crises, contemplation and ceremony? Isn’t there any more to Him than that? 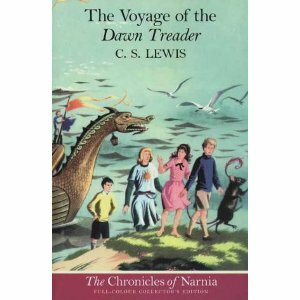 I’ve just finished re-reading The Voyage of the Dawn Treader, one of my favourite of CS Lewis’ Narnia books. It’s an allegory of the Christian life, and it certainly considers Christianity to be an adventure. At the end of it, though, Lucy and Edmund are told by Aslan that they will never again return to Narnia. They need to detach themselves from this ‘dream’ world and engage fully with our world. I think very often when people have got past the initial thrill of finding Jesus, they begin to ‘grow up’ and cast aside their wonder and sense of adventure. They settle – following the example of those of us who have been Christians for years – into a rut of quietly plodding along to church, Bible Study and prayer meeting, adding God into their weekly routine, rather than having their entire world shaken up by him. During Lent, Stewardship (a UK Christian charity set up to inspire and facilitate charitable giving) have been running a blog called 40Acts. For each of the 40 days of Lent, different contributors have suggested acts of courageous (though usually fairly simple) generosity that we can take part in as a response to the astounding generosity shown by God to us. Living the kind of generous lifestyles suggested on the blog would certainly be an adventure. Just look at today’s for example! We need to live in such a way that the world sees that the decision to follow God is not a decision to abandon forever any hope of and adventurous, exciting life, but is a decision to enter into the most amazing, roller-coaster ride of your life. You can still slouch in the back pews if you want to, wondering why you’re bored all the time, or you can engage with the God who still performs miraculous healings, who still provides in mysterious ways for His children, and who gives ordinary men and women the courage and grace to be salt and light in whatever corner of the world he has placed them in. Will you join the great adventure? Perhaps that explains why I often end sentences with a preposition. I do love that thought, though. Yes, that’s so true! I’ve got a bookmark somewhere that I’ve had for years that says ‘If you search with a lovely thing in mind, that is what your heart will find.’ I’ve always thought that was a really useful piece of advice, too. If you expect church to be boring and irrelevant, it probably will be! No reason to be bored, listen and obey and the ride of a lifetime begins! and the Gospels with this heart of listening and obeying, and found her amazing adventure just beginning. Powerful stuff! Living for Jesus in the real world is not boring, but it is an adventure. Great Post, and once leaving “Narnia” there is no turning back! !